The year is 1871, and Tiki has been making a home for herself and her family of orphans in a deserted hideaway adjoining Charing Cross Station in central London. Their only means of survival is by picking pockets. One December night, Tiki steals a ring, and sets off a chain of events that could lead to all-out war with the Fey. For the ring belongs to Queen Victoria, and it binds the rulers of England and the realm of Faerie to peace. With the ring missing, a rebel group of faeries hopes to break the treaty with dark magic and blood--Tiki's blood. Unbeknownst to Tiki, she is being watched--and protected--by Rieker, a fellow thief who suspects she is involved in the disappearance of the ring. Rieker has secrets of his own, and Tiki is not all that she appears to be. Her very existence haunts Prince Leopold, the Queen's son, who is driven to know more about the mysterious mark that encircles her wrist. 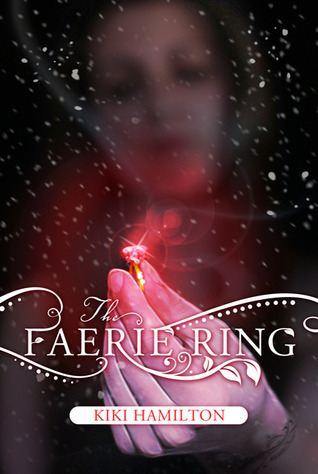 The Faerie Ring is one of the more difficult books to review that I've read lately. On one hand, I absolutely adored the book. On the other hand, from an objective standard, I can see numerous problems with the novel. The good side first...The Faerie Ring carried me away. It is the perfect combination of historical fiction and fantasy. The book is set in Victorian England. You get to see the extremes of wealth and poverty in this novel since Tiki, the main character, lives on the streets while Leo, another main character is the son of Queen Victoria and lives in Buckingham Palace. I like how the book doesn't glorify the poor while demonizing the spoiled rich. Tiki is obviously our hero, but the wealthy characters in the story, while a bit careless, were good people. It's really fey versus humans. Ms. Hamilton did a wonderful job capturing the feeling of the poverty of Victorian London. We see dirty streets, little ramshackle hovels, flower sellers, and pick pockets. Yet we also see equally good descriptions of wealthy London - grand balls, palaces, and fashion. Tiki is a fabulous character. She's a professional pick-pocket living on the streets. Such a difficult life could harden a person, but Tiki has remained kind. She puts up a good front, but at heart she's a teenage girl with insecurities and fears. I loved her "family" as well, the group of waifs she lives with, particularly the littlest girl. I had some difficulty telling the older characters apart. The main guy in the book is Rieker who is handsome and most of all mysterious. Also a professional pick-pocket, he appears to protect Tiki...or is he trying to harm her? He figures out quickly that Tiki is involved in stealing the Queen's ring and knows an unusual amount about its faerie origin. What I loved most about Ms. Hamilton's portrayal of Rieker was the mystery. For much of the book, Tiki instinctively distrusts him. My reaction was the opposite - I assumed he was trustworthy. But there were enough oddities in his actions and personality that neither Tiki nor I could be sure about Rieker for most of the book. I liked discovering Rieker alongside Tiki. My favorite part about The Faerie Ring bleeds into my least favorite part. When I was reading this book, I was transported across a continent and back 150 years. I was transfixed by Tiki, Rieker, and the other characters. I marveled at Tiki's ingenuity and was awed by her gorgeous outfit at the Queen's ball (what would a good YA book be without some fashion?). I was terrified by every close call and the increasing danger of the fey. It is unfortunately rare for a book to make the world disappear around me. So that's good...but once I finished the book, all these doubts crept in. The world-building is considerably lacking. We don't discover much about the fey legends until the end of the book and even that is incomplete. And the book is full of inconsistencies and big coincidences. Obviously you have to suspend some belief for a book centering on a ring that symbolizes peace between the fey and humans, but so many things worked out "just in time" for Tiki. And the theme of a poor girl really being a lady and blossoming once you put a pretty dress on her is overplayed. In retrospect, I don't like the ending. It is both too perfect and incomplete, for different reasons. In some ways I loved The Faerie Ring and in some ways it was lacking. I give it high marks for carrying me away as I read it, but lower marks for not holding up well after I finished it. I was the same way. There were some things I liked but also a lot of things I disliked. It just wasn't what I was expecting or looking for so I was disappointed. Not really for me. I would be intrigued to read it as I love Victorian London, so with the added faerie element, it sounds brilliant. I've been wanting to read this book for a while now. I hope I enjoy it. Sorry to hear it was lacking . . . Anyway great review! I've read mixed reviews for this one. It sounds like one that I would like to try for myself. Sometimes just being carried away is enjoyable, and I can forget the other issues. Great review! I can definitely see how the book's flaws would overshadow the good parts. It almost comes across as if the fantasy part was tacked on at the last minute. Perhaps if it was made clear that this book is start of a series, then I could forgive about the rushed ending. I do love the Victorian England so I'm still interested enough in picking it up, but thank you for the heads up on the lack of world building. Author Gail Carriger shares her favorite romantic book scene at The Midnight Garden! Good review! I really loved this book too, but was not very satisfied with the ending, which did seem very quick and easy overall. Hopefully, things will be explained more in the sequel. This is probably my biggest problem with blogging about books - I will absolutely love a book while I read it, but when it comes time to review it, my critical mind starts to pick up on things I didn't notice while I was reading, but later realized were flawed in some way. Sometimes I think once we set a book down we see the flaws more. The story itself may be captivating, and the characters stunning, but all of a sudden the doubts come. I thought this book had an interesting plot line. I really fell into the main character fast. You're right. This is one of those books that initially sweeps the reader off her feet (it totally happened to me) but, once done and the reader has time to reflect, there are inconsistencies that irritate. Still, I think I'll stick with my initial impression and be swept off my feet. :) Great review! I haven't read this one yet, but I really want to one of these days. I've heard really great things about it, but at least now I know not to have super high expectations. I'm so guilty of doing that a lot. I'll still give it a try. Thanks for the very fair review. Great review. I love the sound of this book, and I'm definitely interested in the historical/ fantasy aspect of it. I have to pick it up very soon! Manga Mondays (90): What Was Your First Manga? Vampire Empire Giveaway: Ends Tomorrow Feb 7! !